Designed a wagon for the potion vendor to work, sleep, and travel in. Started out with some doodles in the sketchbook trying to find an interesting shape and also make it functional. A basic block in 3D allowed me to make sure that everything worked. The people of Root City zip around between major and the satellite markets on their personal ‘jetskiesque’ water crafts. No two vehicles are ever the same. It all depends on what kind of parts you can scrounge up. 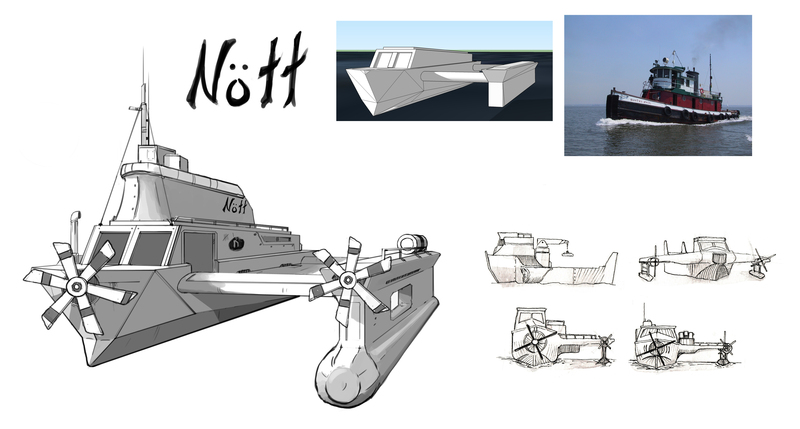 The initial design for the hero’s ship. This will probably go through some more iterations as the project goes on, but I felt like this was a good starting place. Potential vehicles for the Life on Water series.